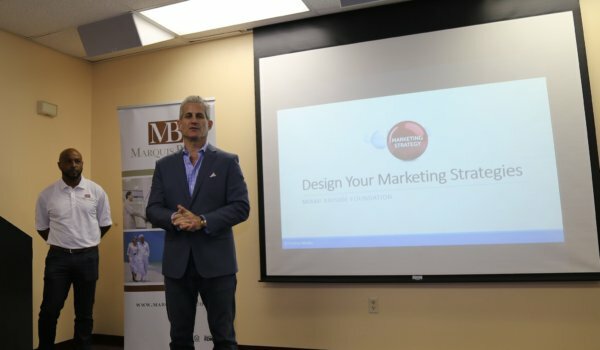 Overtown, Fla. – On September 28, 2018, Miami Bayside Foundation (MBF) along with Marquis Bank hosted an in-depth Marketing seminar for local small business owners. The one-day event, hosted by the YWCA and led by Orlando Espinosa, co-founder of Emineo Media, focused on “Defining Your Marketing Strategies” and covered key marketing topics such as business objectives, target audience, and social and digital marketing. Participants, ranging from those looking to start up to those looking to scale their businesses, where able to conduct a deep dive into their current marketing strategies and throughout the day create new, individual marketing plans. Marquis Bank, with more than $580 million in assets, is a full-service community bank dedicated to serving business owners, professionals and investors. Marquis has successfully blended convenient state-of-the-art technology with personal attention to create an exceptional banking experience for its clients. For more information, please call (305) 443-2922 or visit www.MarquisBank.com.